The last couple of years have been notable for OLED (organic light-emitting diode) screen technology. A growing number of smartphones are getting equipped with the technology (such as Apple's high-end iPhones and the Samsung (NASDAQOTH:SSNLF) Galaxy lineup), and affordable ultra-high-definition OLED TVs are growing in number, too. OLED screens are expected to continue gaining market share over older LED technology because of their more vibrant colors, better dark and light contrast, smoother moving images, and power efficiency. To capitalize on the migration, investors may be drawn to OLED manufacturing leaders like LG Display (NYSE:LPL) and Samsung. However, manufacturing is a less lucrative investment than owning a piece of the company that has the patents on OLED itself. Why take a slice when you can have it all? That's where Universal Display (NASDAQ:OLED) comes in. Rather than betting on individual pieces of the OLED industry, Universal Display lets investors benefit from the whole movement. That's because Universal Display owns patents on the tech and sells the organic compounds needed for the creation of OLED displays. Thus, as the next generation of screens hits the market, Universal Display benefits no matter who is making them. An LG ultra-high-def 4K OLED TV. Image source: LG. Universal Display's management has been excited to talk about all of the new devices set for launch in the next couple of years that will feature OLED. There is still growth left in the tank in the smartphone market, and new form factors like foldable phones and tablets are being dreamed up. The OLED TV market is nascent, as are the automotive display and lighting markets. As promising as Universal Display's prospects sound, 2018 hasn't been the greatest of years. Shares have been halved from their all-time highs as management chalked up a modest sales decline to a year of transition for many manufacturers. That also shows up in the numbers from LG Display, one of the leading makers of OLED screens. The company has been transitioning old and lower profit-margin LED manufacturing lines to new OLED counterparts, resulting in a soft year for new sales. Data source: Universal Display. P.p. = percentage point. YOY = year over year. 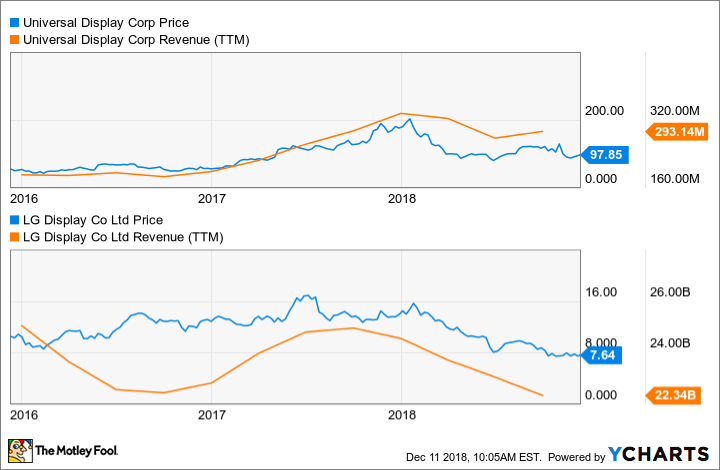 Thus, if Universal Display can mount a sales rebound in 2019, operating profits should increase at an even faster rate -- the opposite of what happened in 2018, when falling sales equated to faster-declining profits. That's because the company hasn't yet reached a scale in which it operates at peak efficiency. That means this is the stock to own if an investor wants to bet on the ascent of OLED technology. Those high profits are untouched by any manufacturer. LG Display, for example, has an operating margin of just 11.3% over the last year, which drove a net loss for shareholders. LG Display's operating margin should improve as the company continues to update its manufacturing lines, but the resulting earnings increase likely won't come close to what Universal Display can muster. In short, there are a lot of ways one could buy into the migration to OLED displays. Universal Display, though, is a pure play and has the most to gain from the movement. Other OLED stocks can be ignored in favor of this one.